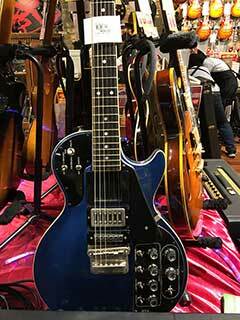 Check out the rare blue GS-500! 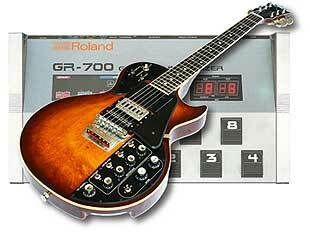 The Roland GS-500 is the dedicated guitar controller for the Roland GR-500 analog guitar synthesizer. 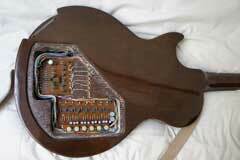 Even with substantial parts of its body cut away for the installation of support electronics, the GS-500 weighs in at more than 11 pounds. 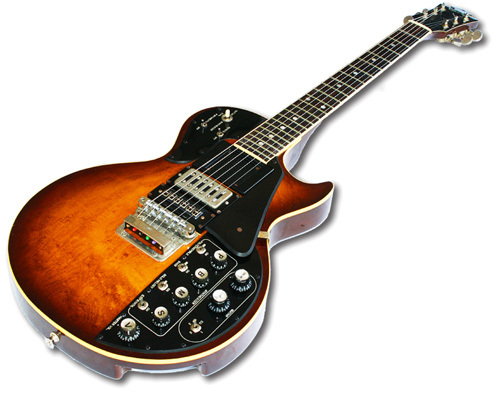 The GS-500 has been described as having a honey burst finish, and it is a uniquely beautiful instrument. 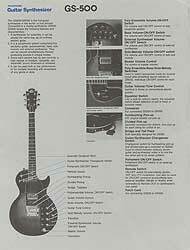 The GS-500 marked the beginning of the partnership of the Roland Corporation with Fujigen, the Japanese builders of Ibanez, Greco, and ultimately Fender guitars in the land of the rising sun. 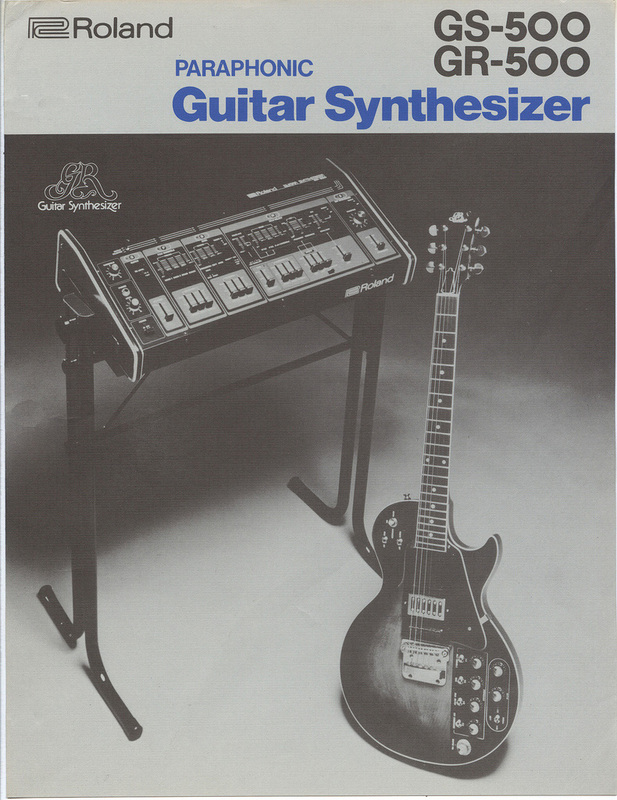 Products built by Fujigen for the vintage Roland synthesizers would take the name of "Fuji Roland," a marking found on both guitars and synthesizers. The Fujigen website still features a picture of the GS-500, along with the claim of building the world's first guitar synthesizer. 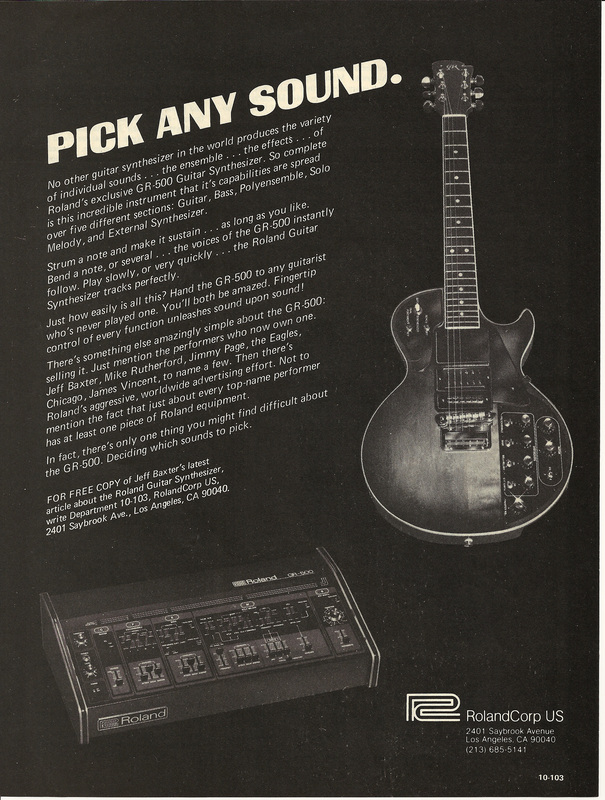 The retail price on the GS-500 was around $1,000 in 1977, which converted into today's dollars equates to an astonishing $4,300. 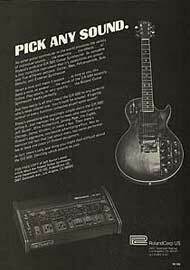 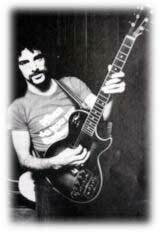 So think of the GS-500 as being the equivalent of a high-end Paul Reed Smith guitar, or the Moog Guitar. 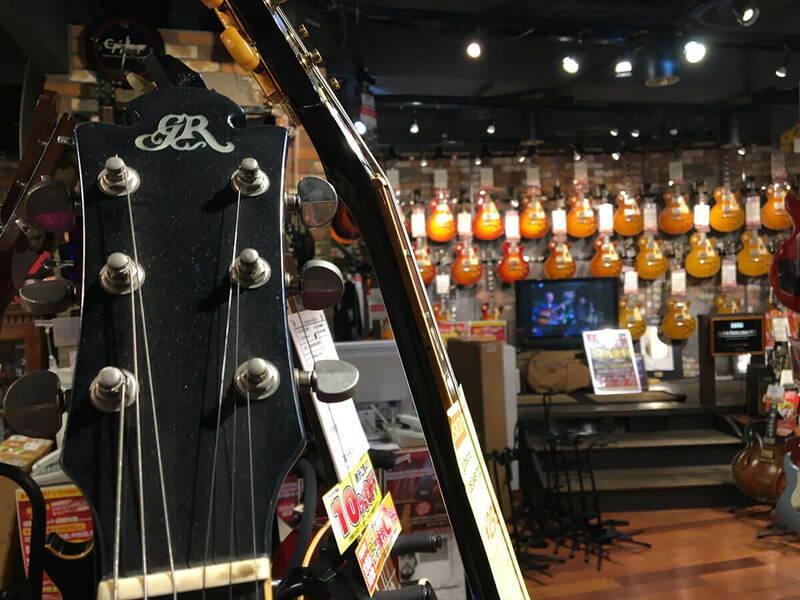 Of course, there are as many styles of guitars as there are guitar players, but if you are a fan of vintage, weighty Les Paul guitars, you will enjoy playing the elegant GS-500. 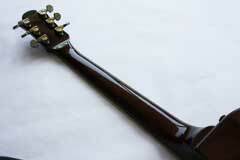 The neck is around 42 - 43 mm, with a pleasing modern shape. 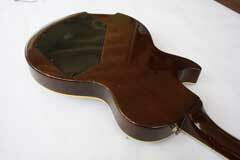 The neck is somewhat between the slimmer G-303/808 guitars, and the chunkier G-505 guitar. 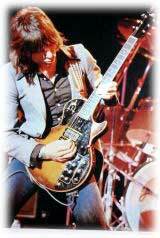 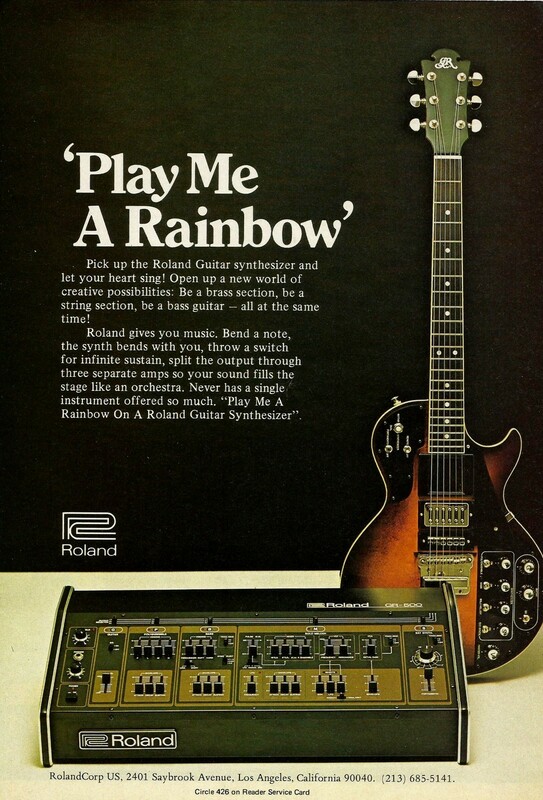 When I first picked up the GS-500, I wondered why Roland included the little three-way EQ toggle switch on the guitar. 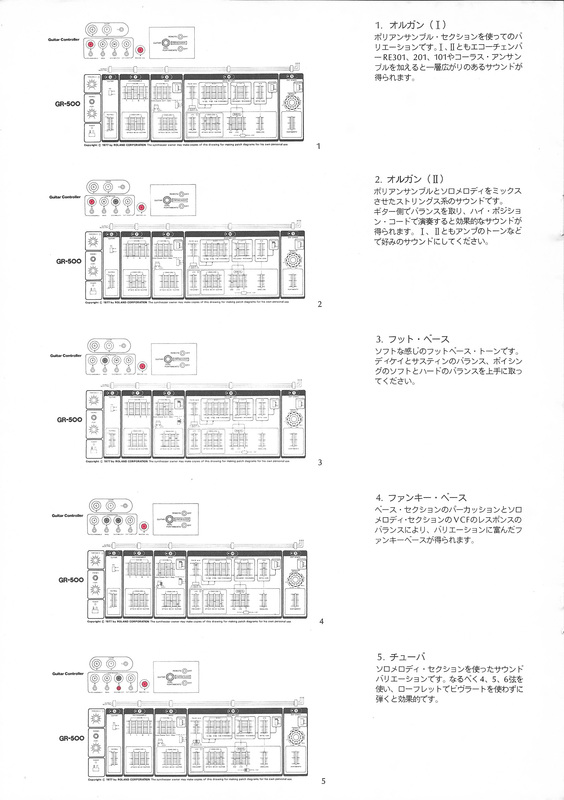 The owner's manual explains the switch has three sounds: "1", normal, full-range sound. 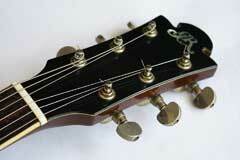 "2" hard, low-cut sound, and "3", acoustic, slightly attenuated lows and highs. 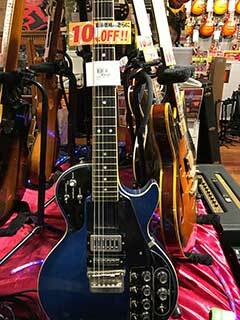 You can watch the video clips below and evaluate for yourself the sound of these three modes. 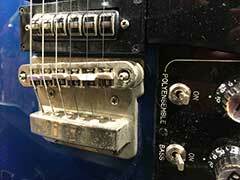 In any case, I did come to appreciate the value of this three-way toggle switch. 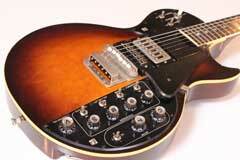 The GS-500 has only one humbucking pickup, so there is no way to quickly switch guitar tones by changing pickups. 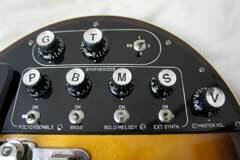 But the three way equalizer toggle switch adds a quick way to access a variety of sounds. This is helpful, since the GS-500 has only one pickup. 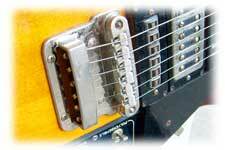 The second pickup position has been replaced by a very strong set of magnets, needed for the infinite sustain system. In addition to the traditional volume and tone controls, you will notice the GS-500 has additional knobs to control the levels of the various synthesizer sections in the GR-500, plus a master volume control. The red LEDs in each section work with the volume controls on the guitar, indicating whether a section is on or off, with the brightness being an approximate indication of the output level. 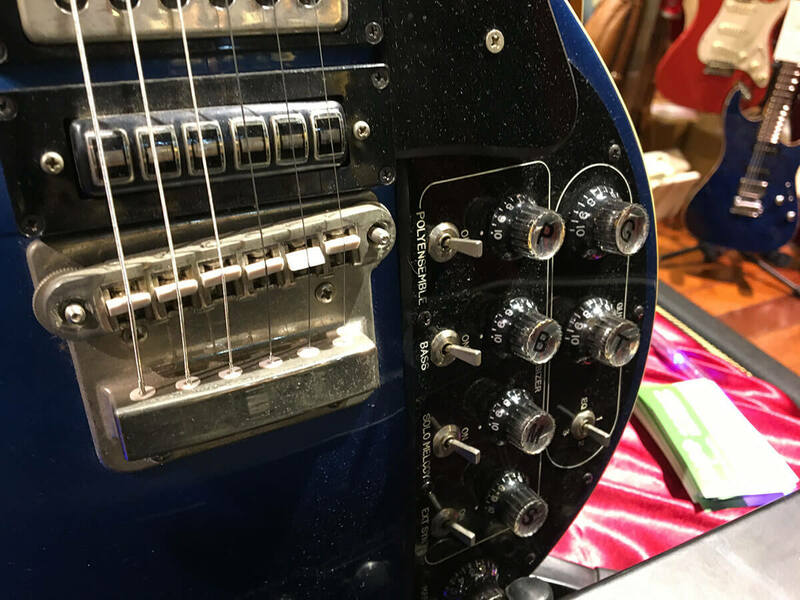 The early GR-500s are generally seen with the pin-type connectors, and they use the C-24B 24-pin cables with pin-type ends more commonly identified with the Ibanez 24-pin synths and the Korg Z3, though the Roland SCC-700 used the same connectors as well. 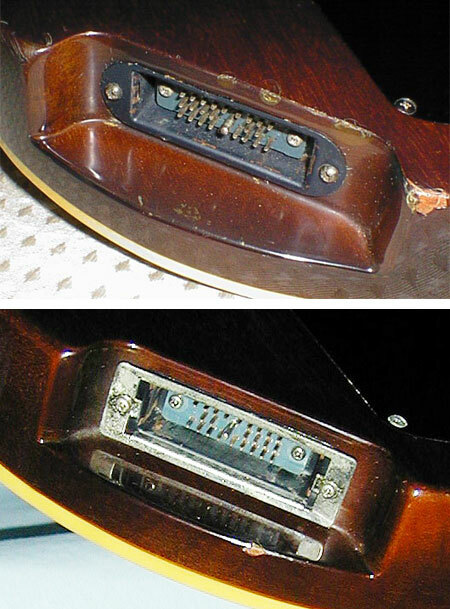 The later GR-500s switched to the locking ring connectors, the C-24D. 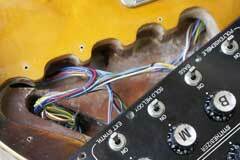 These are the much more familiar locking ring cables sold with most of the GR-100, GR-300, and GR-700 systems. 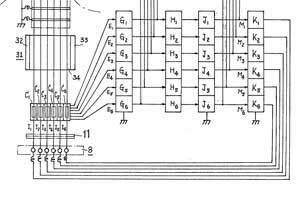 Early 24-pin connector (top), later connector (bottom). 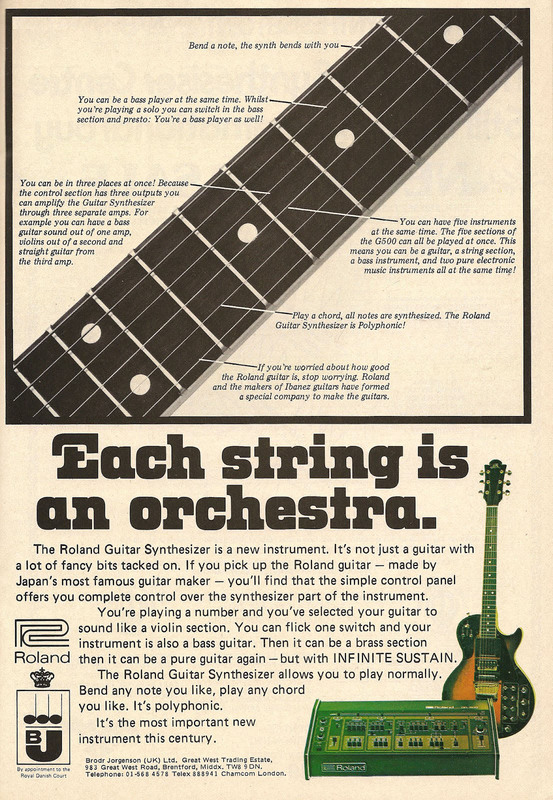 View notes from Roland detailing the change from the original pin-type connector to the positive locking frame connector. 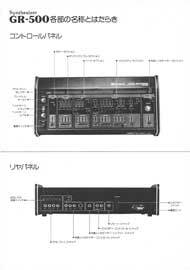 One of the most interesting features of the GS-500 is the infinite sustain system. This is the general idea: two powerful magnets of opposite polarity are placed in the position where you would typically find the neck pickup. 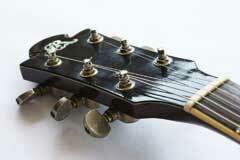 These two magnets are placed just outside the strings, creating a very strong magnetic field across the strings. 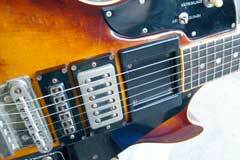 This magnetic field is much, much stronger than the magnetic field typically created by guitar pickups. 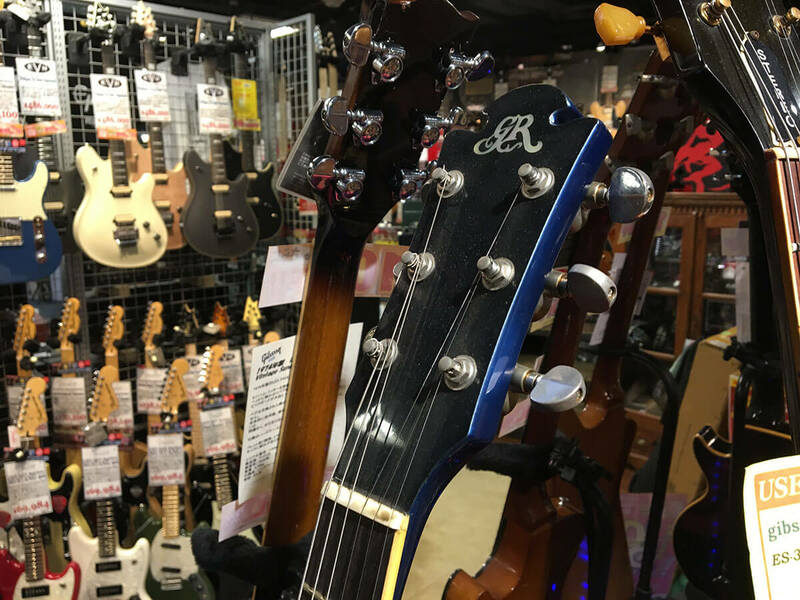 Like other sustainer systems, such as the Fernandes Sustainer, the neck position is used since it is easier to stimulate vibration in the middle of the string, than at the far end. 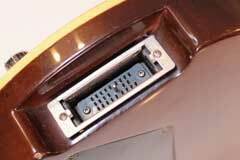 Magnetic assembly in the "neck" pickup position. 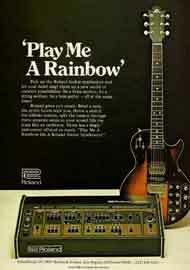 The individual outputs of the hexaphonic synth pickup are greatly amplified, and sent to the unique GS-500 tail piece. 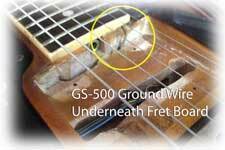 The frets in the GS-500 are grounded. 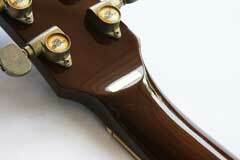 When you fret a string, current now flows through the string. 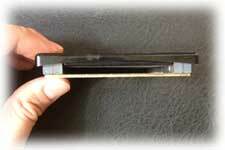 In effect you now have a current flowing through a metal wire in a strong magnetic field. 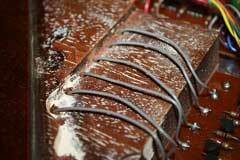 According to Fleming's law, this will cause the wire to move in the magnetic field. This creates a feedback loop: the vibration is picked up by the hexaphonic pickup, then amplified, and the string is stimulated to continue to vibrate at the same frequency. 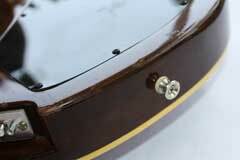 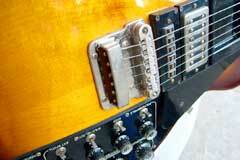 You can think of the sustainer as a "reverse" guitar pickup. 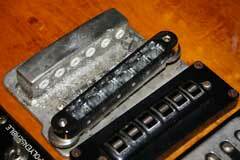 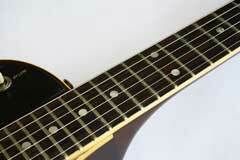 In a normal guitar pickup, magnets in the pickup create the magnetic field. 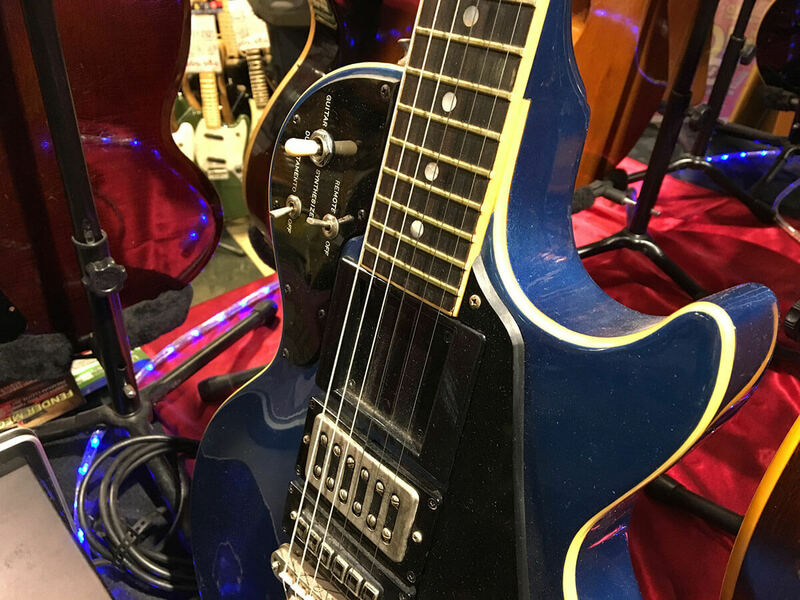 A coil of wire sits in this magnetic field, and the metal guitar string vibrating in the magnetic field induces current flow which is then amplified to create the sound of an electric guitar. 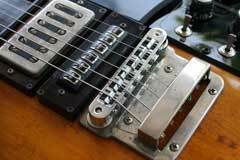 This system would be hard to retrofit to any guitar, especially when one considers the problem of grounding the frets. 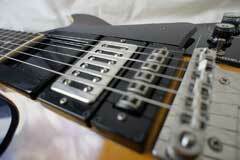 If the GR-500 required a fret job, would this ruin the infinite sustainer? 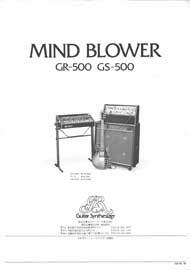 I am not sure if there are enough GS-500/GR-500 systems out there with enough use to know for sure. Plastic saddles in the GS-500 bridge. 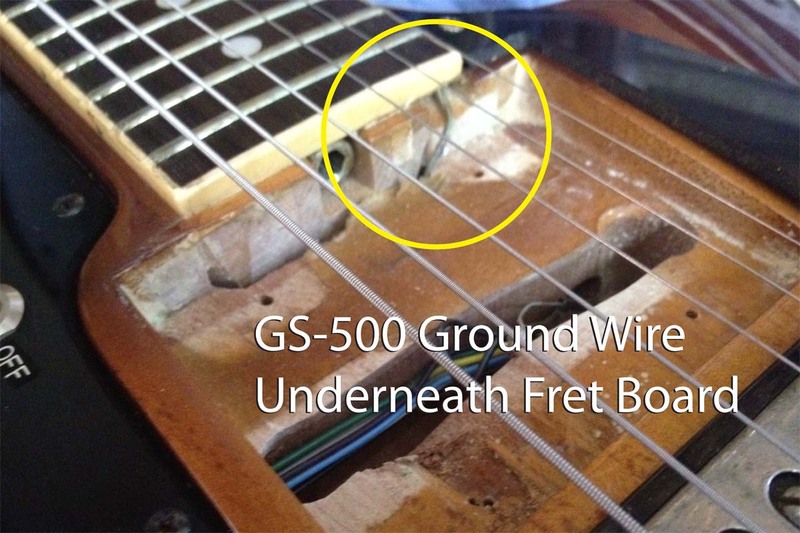 Surprisingly, the GS-500 makes extensive use of plastic parts in the bridge and tail piece to electrically insulate each string, to isolate the feedback signals used to drive each string. 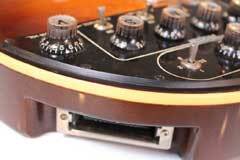 There are small plastic rings in the tail piece, and the bridge in the GS-500 uses plastic saddles, identical to the plastic saddles used in some vintage Gibson guitars. 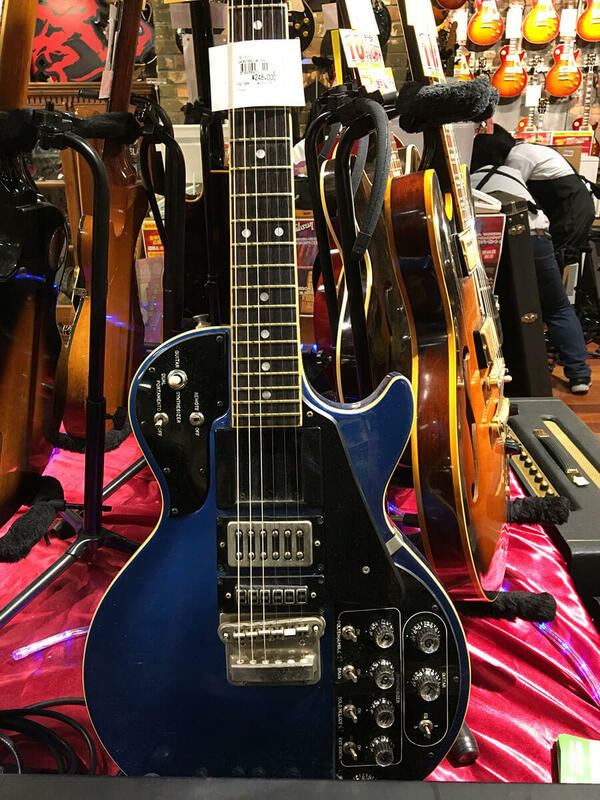 I found an ebay auction for a 1965 Gibson Riviera ABR-1 bridge with plastic saddles, and there were various other vintage Gibson guitars, including SGs, Les Pauls, that used the plastic saddles as well. There is nothing in the GR/GS-500 service manual about plastic saddles. 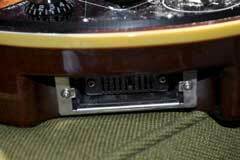 The only GS-500 I have experience with had a non-stock, metal bridge. 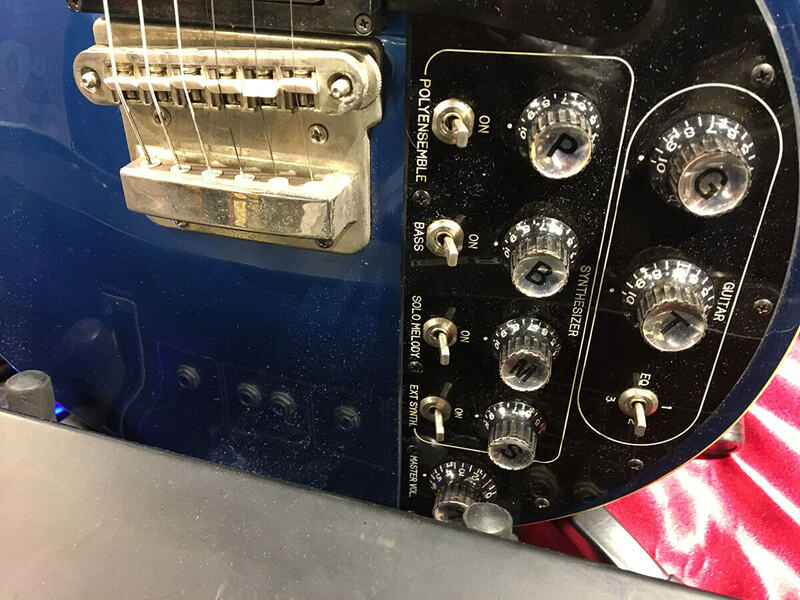 Once I realized the guitar should have an electrically isolating bridge, the clouds parted and the operation of the sustainer seemed much more obvious. 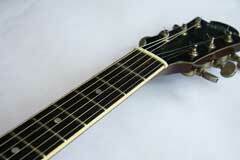 And I realized now that all the old GS-500 photos I looked at showed white, plastic saddles. 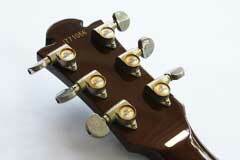 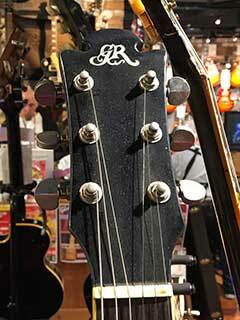 Upon further consideration, plastic saddles are not that uncommon in acoustic guitars, and many electric guitars use a plastic nut, which is functionally very similar to the bridge. 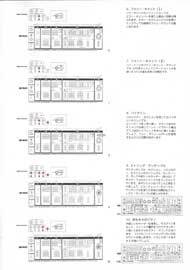 How does the infinite sustainer work in practice? 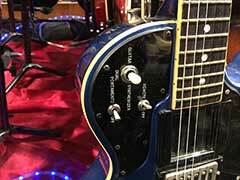 You can check out the demo below to see the infinite sustainer in use. 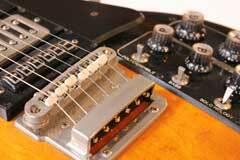 Again, I have to note this: I did these demos with a GS-500 that had a replacement metal bridge! 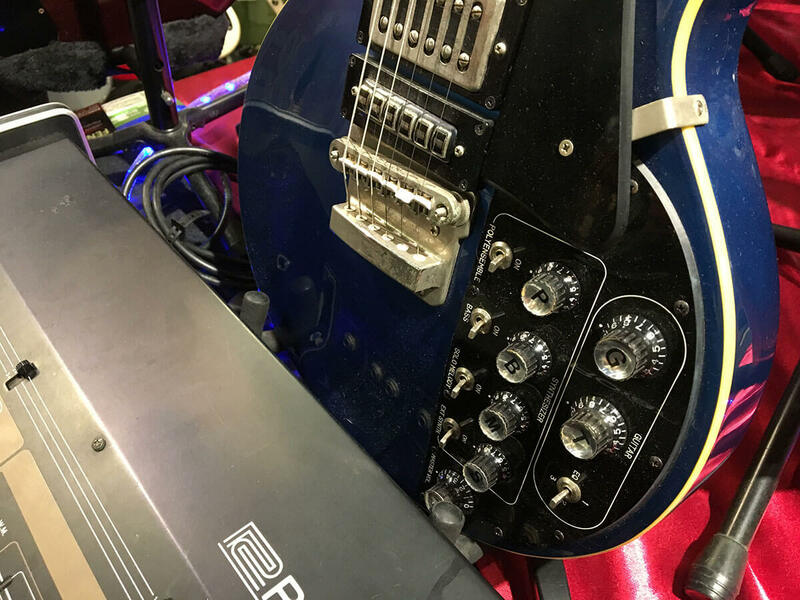 This was before an extensive discussion with Christian Deschamps and Carlos Najar revealed that the GS-500 should have a bridge with plastic saddles. 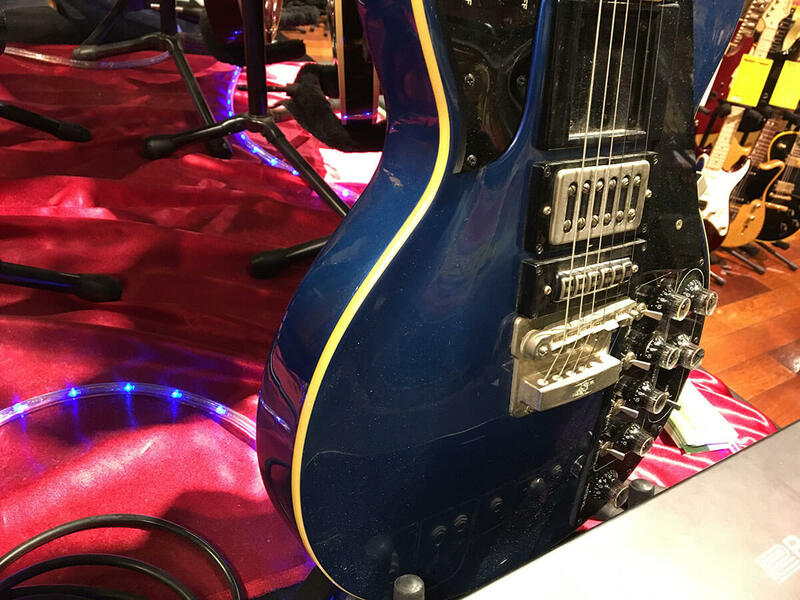 Again, thanks guys for using the gr300 forum to share your knowledge, and to Patrick Phelps for the detailed GS-500 photos! 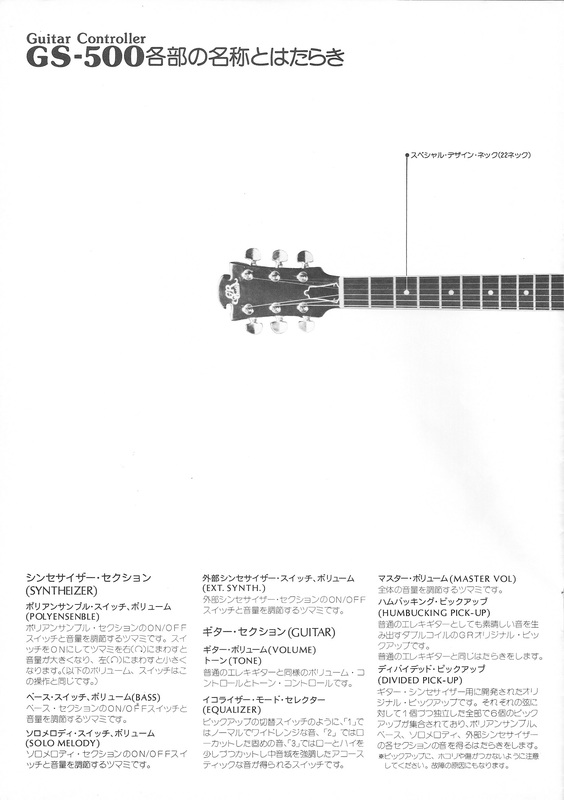 In short, the performance of the sustainer in the video demo is compromised, and the effect I achieved is in part due to sympathetic resonance in the notes of the chord I played. 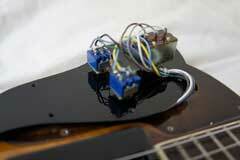 On the other hand, it does show the sustainer circuit is more robust than I had thought. 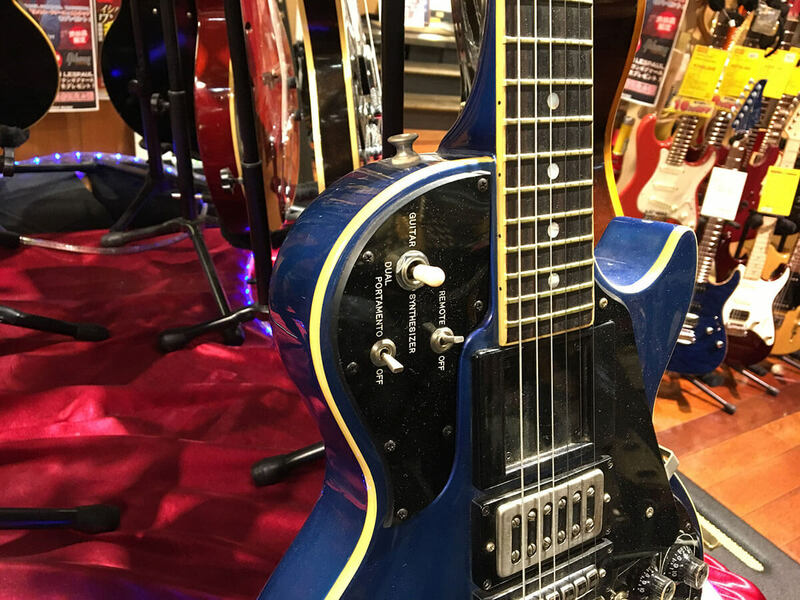 Because of the VCA circuits in the GR-500, one can be fooled into thinking the sustainer has engaged, because the envelope tends to hold a note at a steady volume before suddenly dropping off. 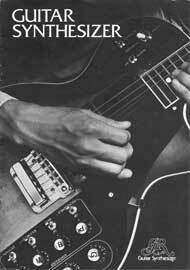 You might think the sustainer is working, when in reality your are listening to the effects of the VCA. 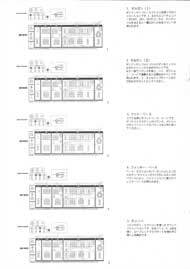 The GR-300 does this to some extent as well. 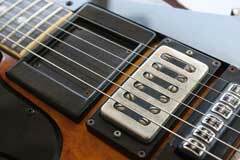 One final consideration: some players are concerned about pickups being placed too closely to strings, since the pickup's strong magnetic fields can inhibit the ability of a string to vibrate freely, limiting sustain. 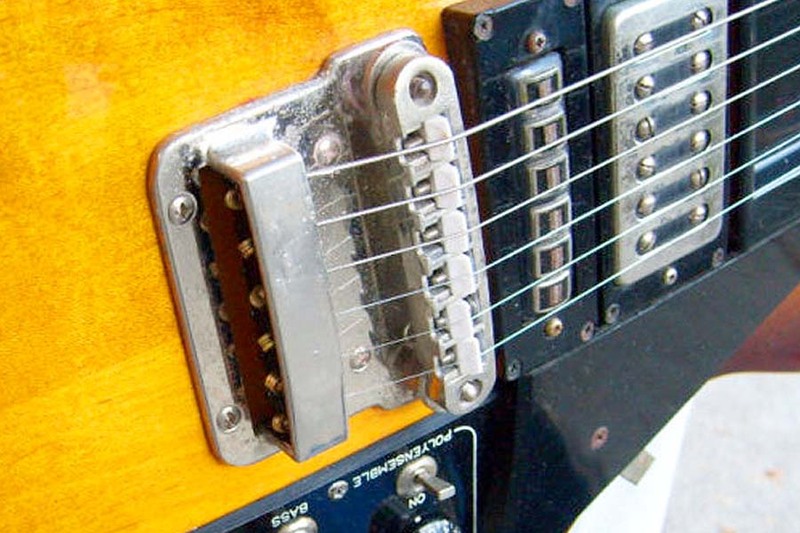 The magnets in the sustainer system surely effect the sound of the guitar, given the strength of the magnetic field is much stronger than conventional pickups. "I noticed that the frets are not so shiny on my GS-500, so an unusual idea came to my mind that possibly my sustainer is faulty due to bad contacts on the fretboard. 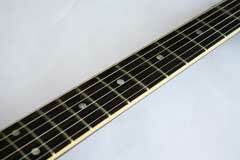 I used a P320-grit sandpaper on the frets. 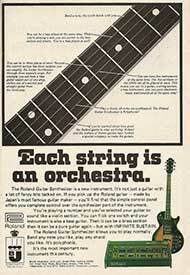 Please note that I didn't remove strings during this process (I know I'm a bit lazy). 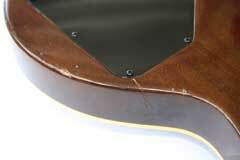 I guess that a higher grade of sandpapers is better, because this operation caused light scratches on the wood finishes. The result is unbelievable! The sustainer works great now!" By chance I came across this incredibly rare, factory blue Roland GS-500 while visiting one of the many excellent music stores in Tokyo, Japan, in November of 2016. The price tag was ¥248,000, or around $2,500. 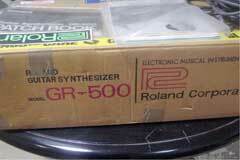 Probably a reasonable price for a factory Roland Blue GS-500, and GR-500. 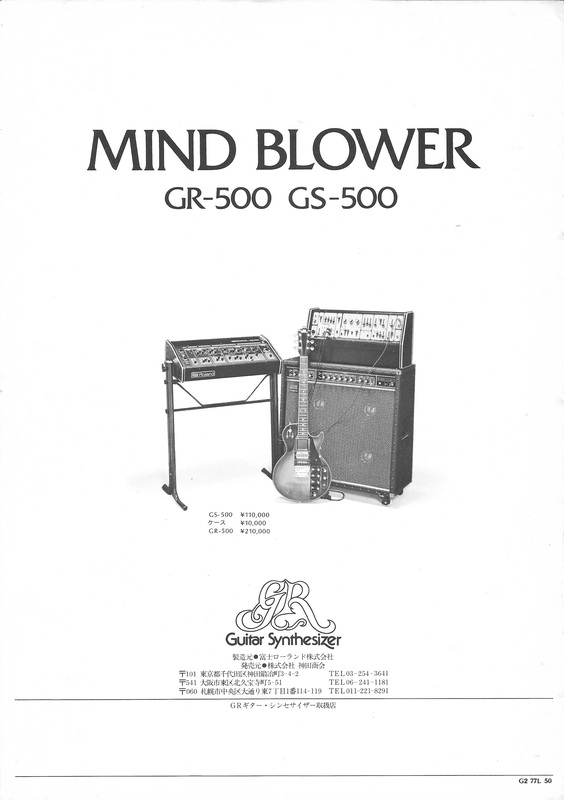 I noted that the GR-500 was a later version, with the Solo Section Tuning Offset and the locking frame (positive type) 24-pin connector. A staff member chatted with me about the GS-500 guitar and GR-500 synth. 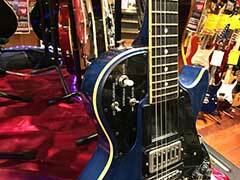 He was not sure of its origin, and not aware of how unusual the blue finish is. This is not the first appearance of a blue, Roland GS-500. 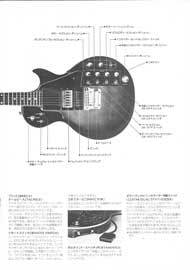 There is a picture of Jeff Baxter holding a blue GS-500 in the book "I Believe in Music", written by Ikutaro Kakehashii, the founder of Roland Corporation. Who knows, perhaps this is the same guitar. 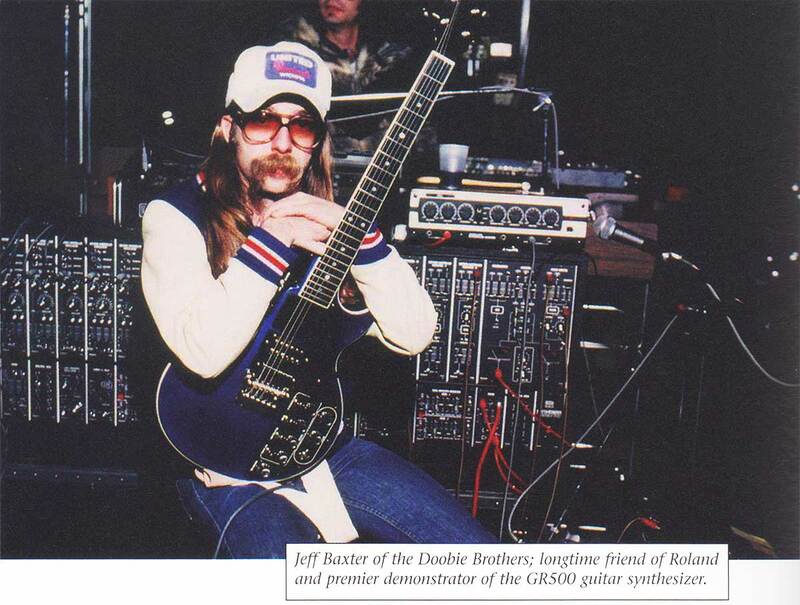 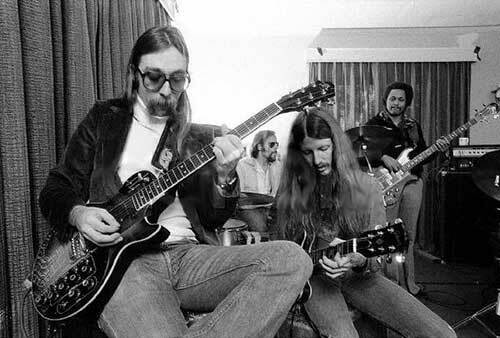 Click on the photo of Jeff to view the original photo with the caption: "Jeff Baxter of the Doobie Brothers; longtime friend of Roland and premier demonstrator of the GR500 guitar synthesizer.". 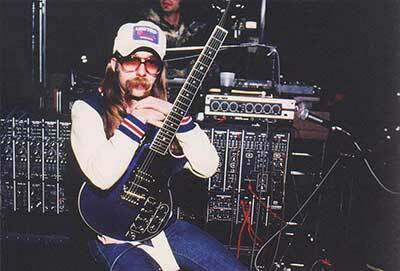 Listen to "Arctic Circles" a short GR-500 demo by Chuck Hammer using the sustain system. 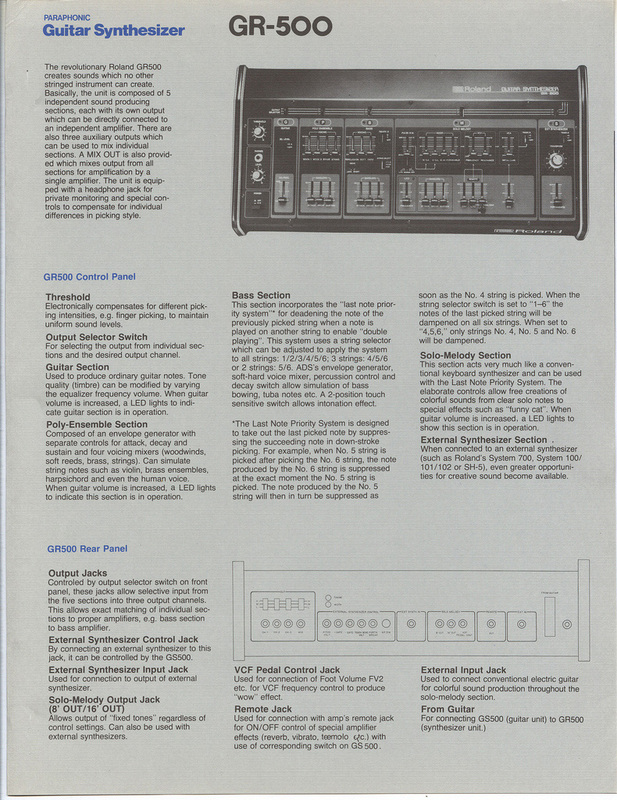 The GS-500 guitar synthesizer controller shares the same basic circuit configuration as the later vintage Roland 24-pin controllers such as the G-202/303/505/707 or G-808. 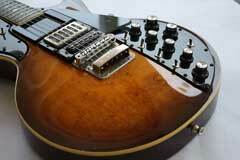 A few simple modifications can make the GS-500 capable of playing the GR-700. 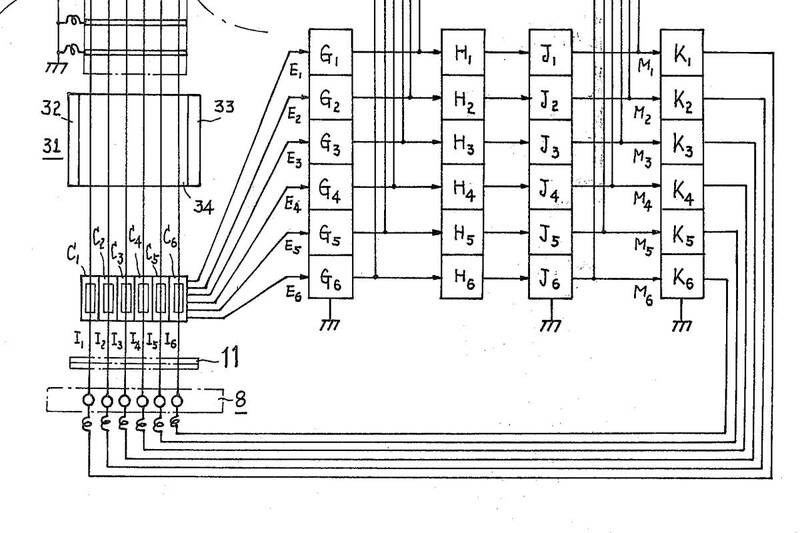 A quick look at the 24-pin chart shows the major problem is the lack of synthesizer volume control, pin #9. 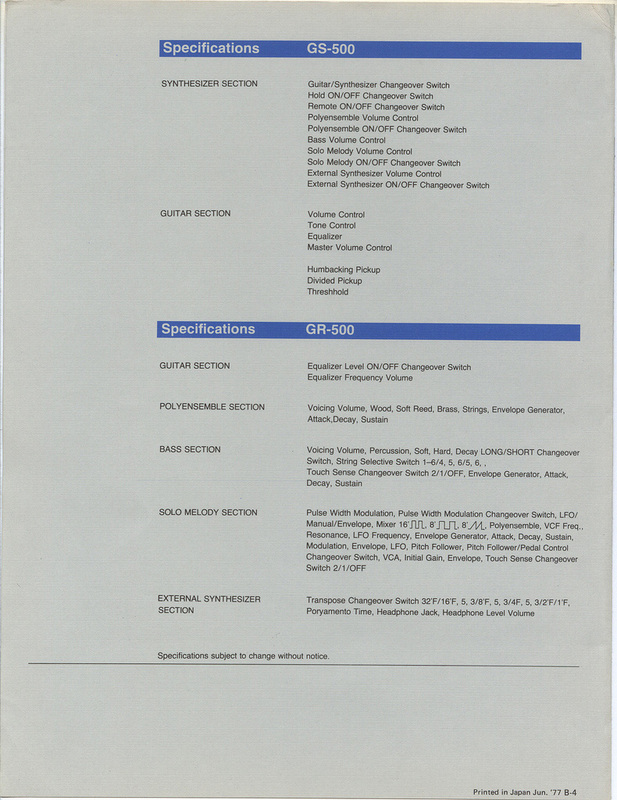 Pin #9 is used by the G-202/303, etc. 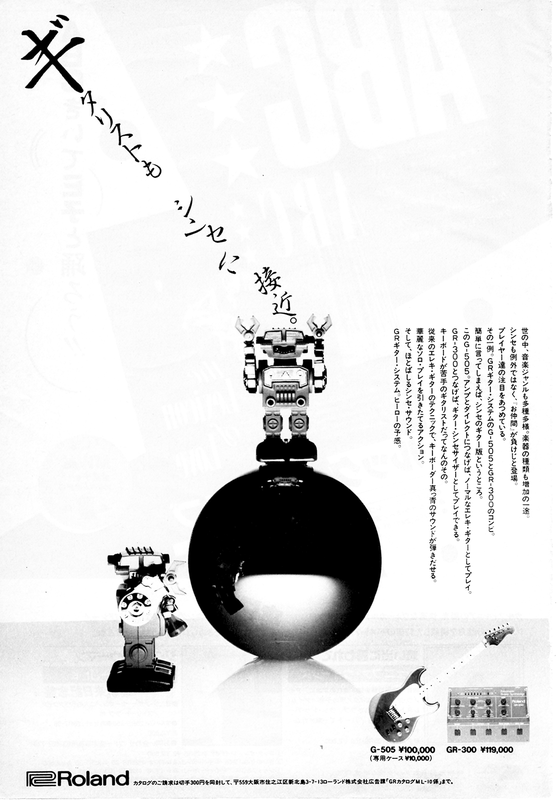 while absent in the GS-500. 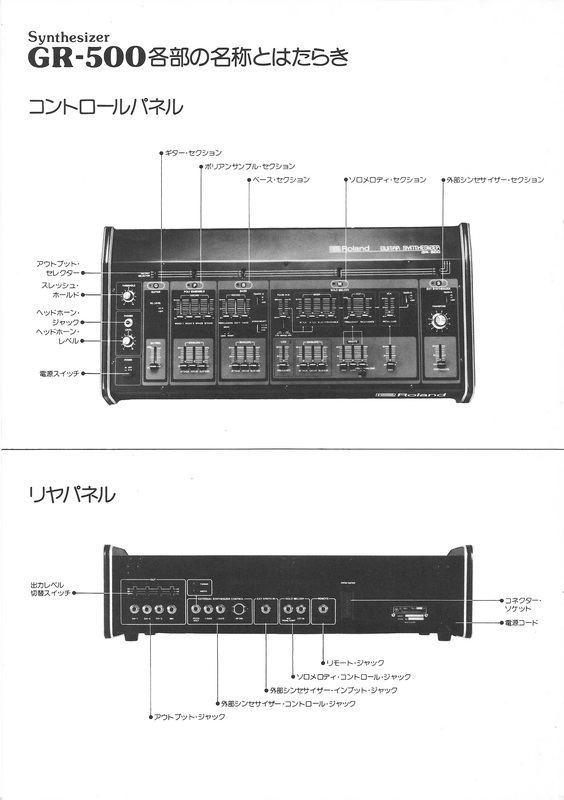 Without receiving a control voltage on pin #9, the GR-700 will appear to work, while producing no sound at all! 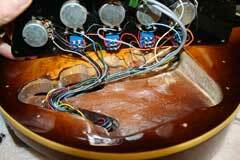 Depending on your ambition and level of soldering skills, there are a few ways to modify the GS-500. 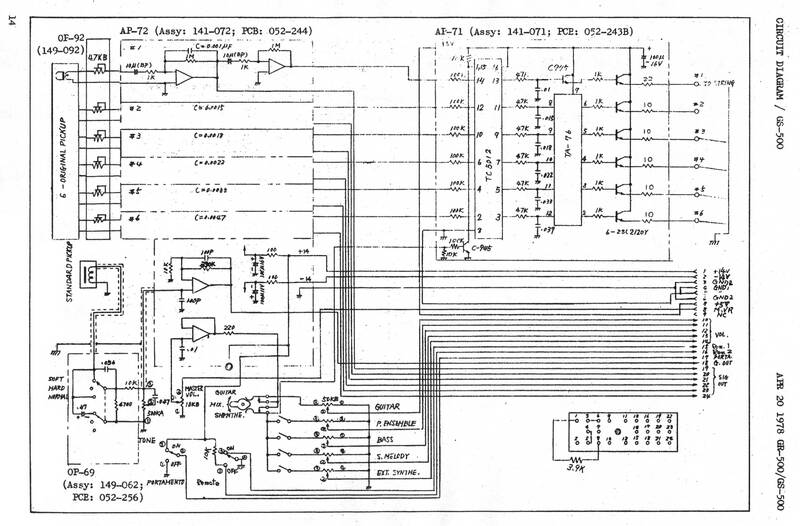 First, thanks to Danny Rowlandson for the help with the pdf wiring diagrams and his willing experimentation. 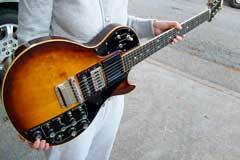 Danny and I exchanged emails in 2011 when he first came upon this configuration of using a GS-500 to play a GR-700. 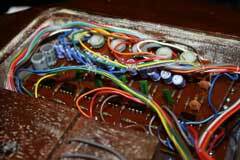 Danny also came up with the idea of adding a 7805 to power the infinite sustain system (more on this below!). 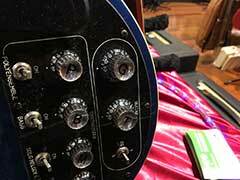 1) Quick Fix: Synth Volume Output. 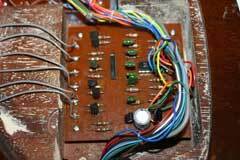 The quickest fix is to wire a 1K resistor from pin #1 (+15 volt power) to pin #9 (synth volume), plus a 50K resistor from pin #3 (ground) to pin #9 (synth volume) inside the GS-500. 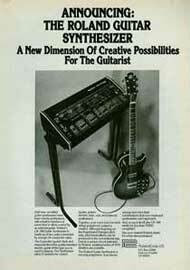 With this change, you can plug the GS-500 into a GR-700, etc. 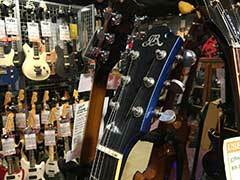 and get sound. Unfortunately, you will not be able to change the volume level, but you will get sound! 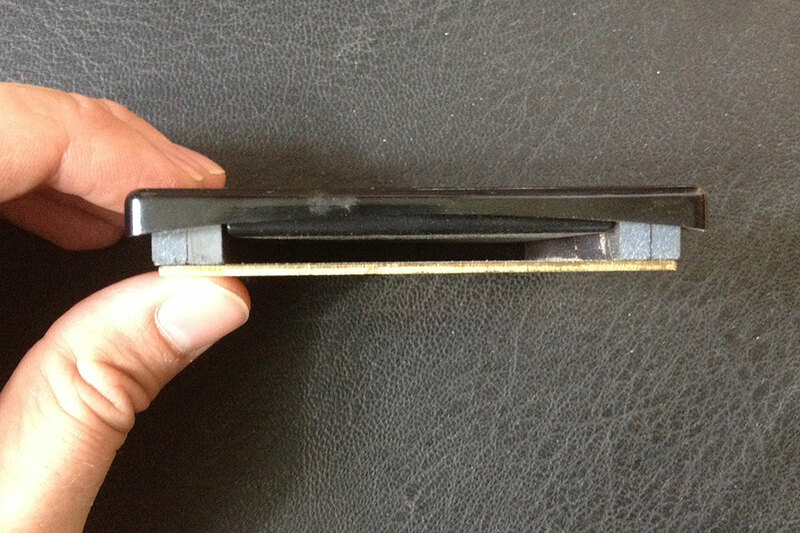 The next step is to wire a 150 ohm resistor from pin #1 (+15 volt power) to pin #8 (master volume). 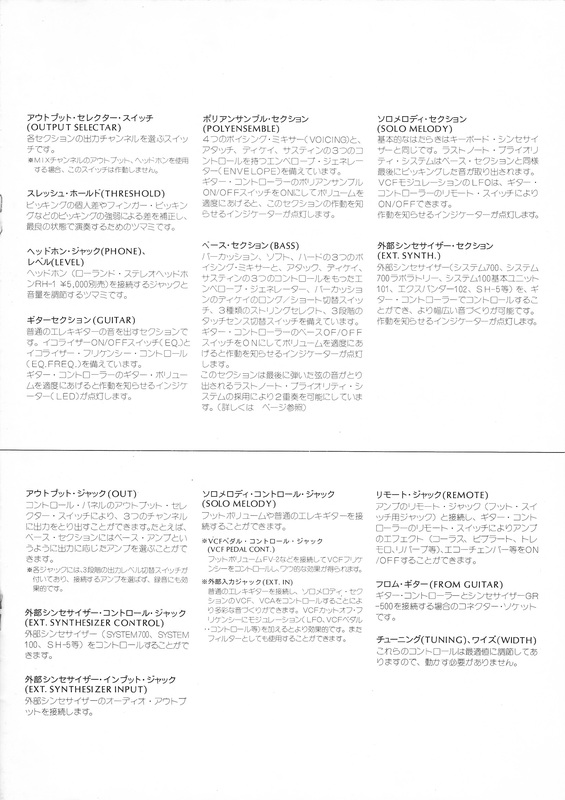 By making this change, you can use the controls on the GS-500 to vary synthesizer parameters, such as filter cutoff, etc. 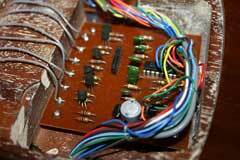 2) Full GS-500 Modification for Driving GR-700: If you are confident in your soldering skills, and feeling ambitious, you can go further with the modifications to the GS-500. 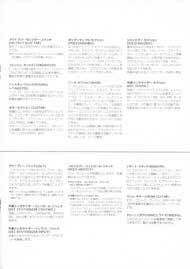 Please check out the pdf linked below. 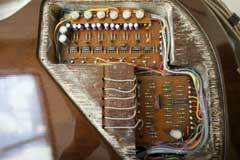 In this modification, a 7805 voltage regulator is added to the GS-500 guitar to generate the +5 volt power supply needed to drive the infinite sustain circuit. 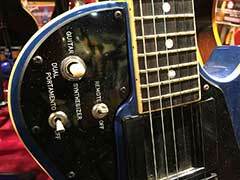 The controls on the guitar are slightly reassigned to produce both a master volume, and synthesizer volume command, plus more. 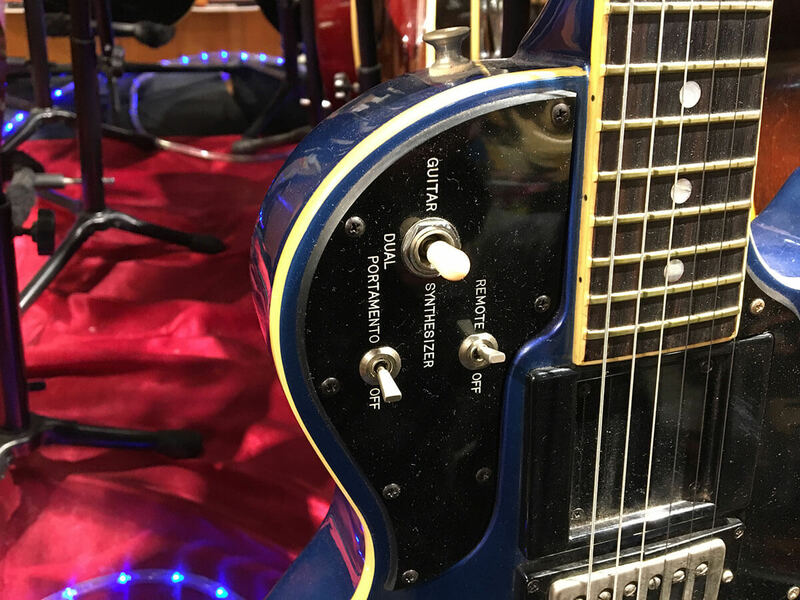 Finally, this full modification changes the function of the Portamento and Remote switch on the guitar to support the GR-100/300/700 mode switch, and provides an on/off switch for the infinite sustain. 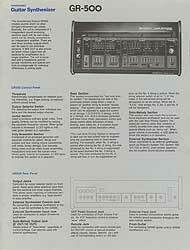 What about the GR-100 and GR-300? 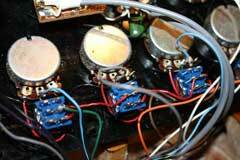 You can basically follow the full modification to get full functionality with the GR-100/GR-300, but I recommend waiting before installing the 7805 voltage regulator if using the GR-100 or GR-300. 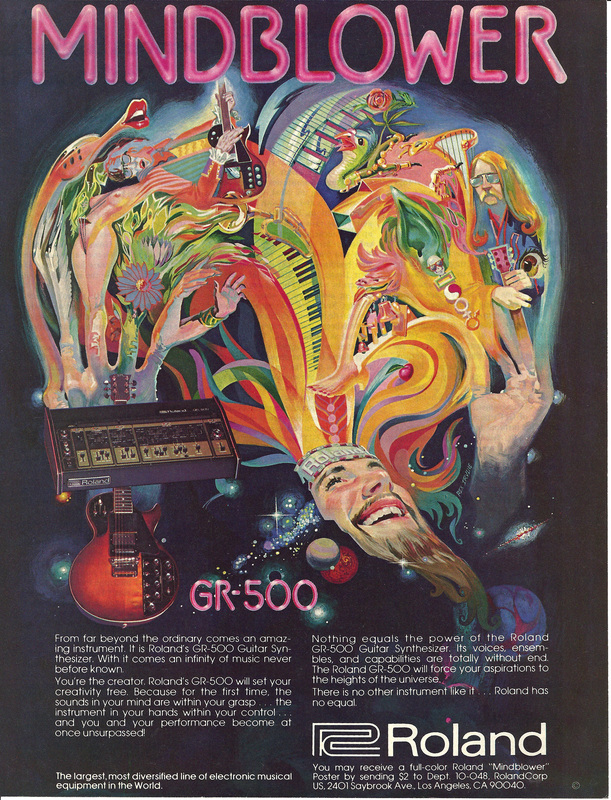 This is because the GR-100 and GR-300 have a smaller power supply, and powering the infinite sustain may draw more current than the GR-100 or GR-300 can supply. 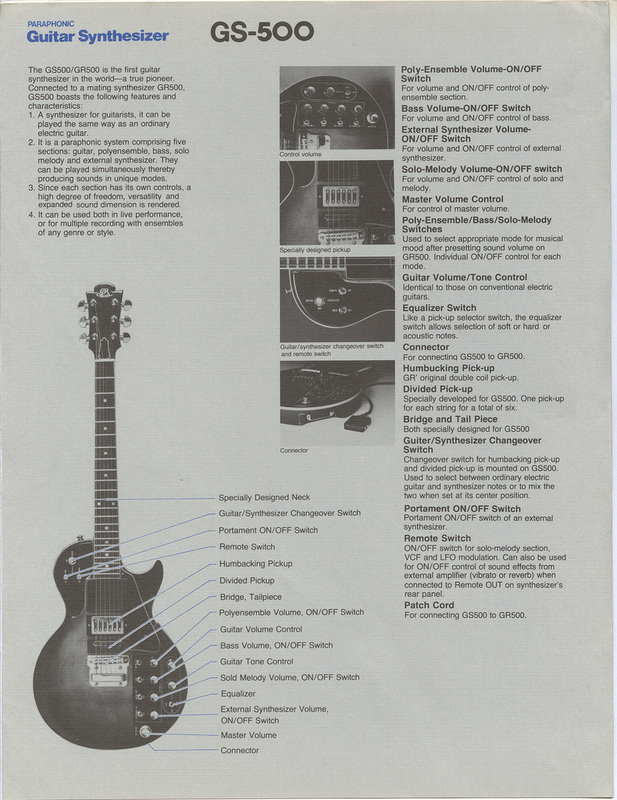 Download the GR-500 Service Manual Schematics. 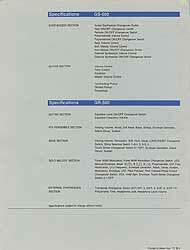 Download the GR-500 Service Manual Addendum. 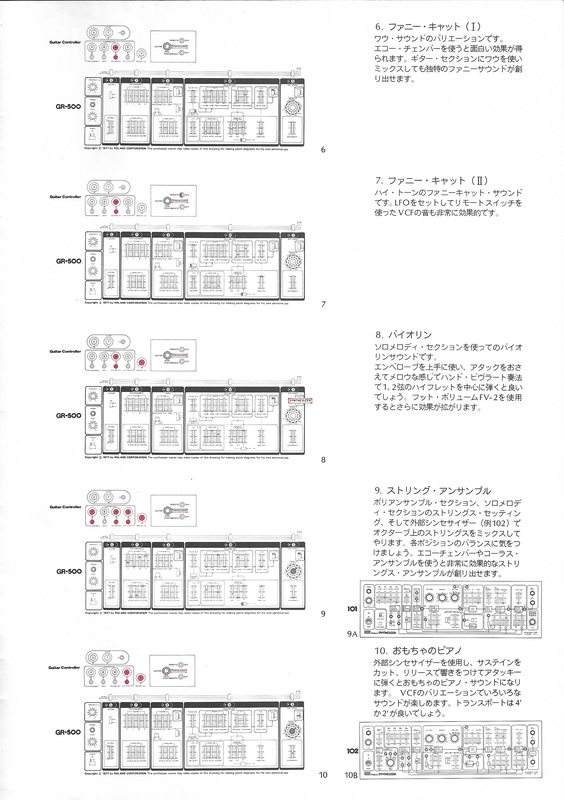 TA-76 Transistor Array Spec Sheet (GS-500 Infinite Sustain System) pdf. 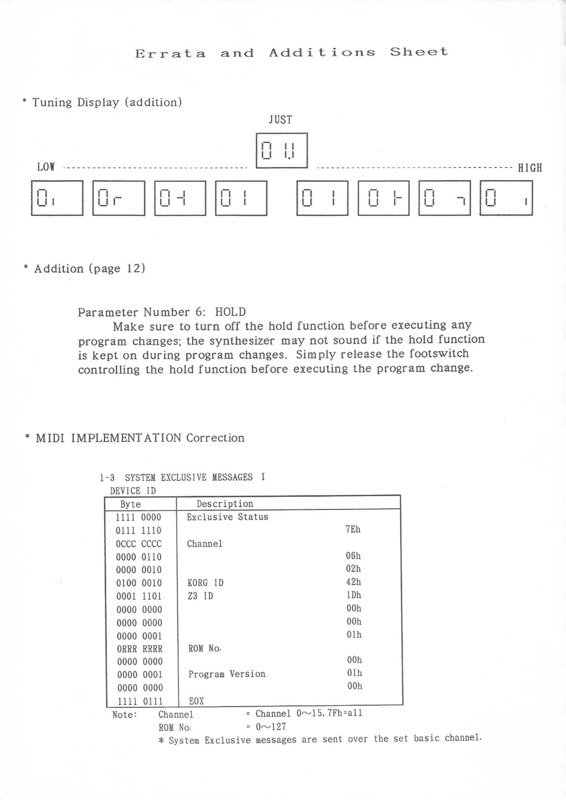 TC-5012 Hex Buffer (GS-500 Infinite Sustain System) pdf.